In part 4 of the Physics Skills Guide, we explain how to draw a line of best fit correctly in Physics Practicals. Read the post to learn about dos and don'ts of drawing a line of best fit. In this Guide, we explain the importance of scientific graphs in Physics and how to draw scientific graphs correctly including lines of best fit. This is a really important Physics skill and you’ll need to master it if you want to ace your next Physics Practical exam. A graph is a visual representation of a relationship between two variables, x (the independent variable) and y (the dependent variable). Place your independent variable on the x-axis of your graph and the dependent variable on the y-axis. Determine a scale, (the numerical value for each square), that best fits the range of each variable. Use a scale that allows your data to be graphed as large as possible in the space provided. The range of each axis may be different. They should each be large enough to cover the needed range without lots of extra space. They do not need to start at zero but it is recommended as this allows you to extrapolate. Clearly label the x and y-axes including the units of measurement. Identify a trend or a relationship between the independent and dependent variables. Remove any outliers from consideration. Draw a curve or a line that best describes the identified trend. Most graphs of experimental data in Physics are linear and not drawn as “connect­ the ­dots”. Only draw the line (or curve) over the range for which you have data. Do not extend your line beyond this range. 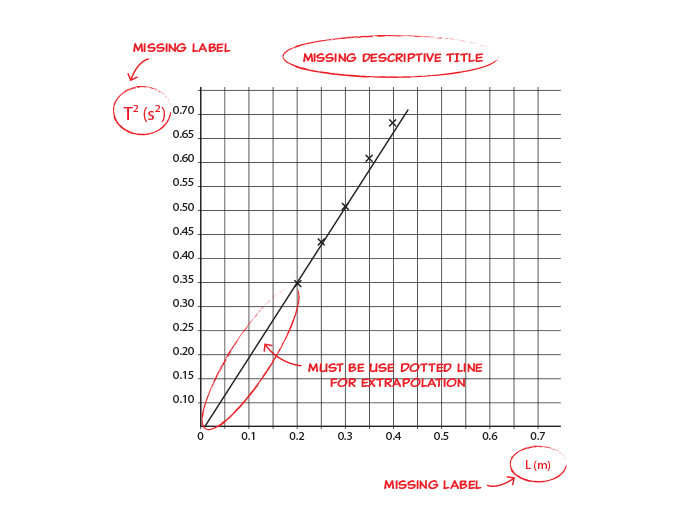 If required to extrapolate (extend the graph along the same slope beyond the range of data), use a dotted line to indicate that you are extrapolating. Your title should clearly communicate what the graph is about. Do not simply restate what is already shown on the axes. In Year 11 and 12 Physics, the trends that you will investigate are mostly linear, or can be converted into linear graphs, and, hence, you’ll be required to draw a line of best fit. The line must reflect the trend in the data, i.e. it must line up best with the majority of the data, and less with data points that differ from the majority. The line must be balanced, i.e. it should have points above and below the line at both ends of the line. 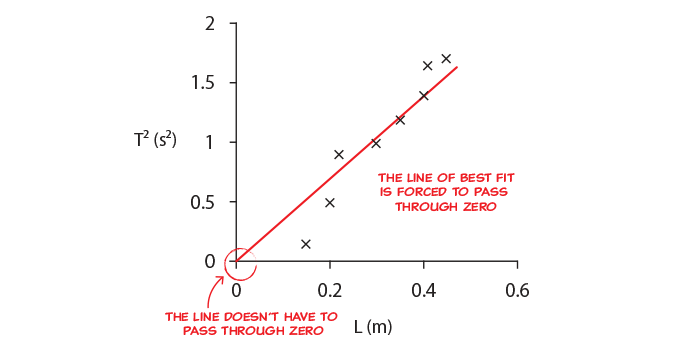 DO NOT force the line to pass through any specific data points, or to pass through zero. The purpose of the line of best fit is to reveal the trend of all the data. Why do we need to draw a line of best fit? How does the line of best fit reduce experimental errors? By drawing the line of best fit we are looking for the strongest trend in the data, and in this way reduce the effect of random errors. 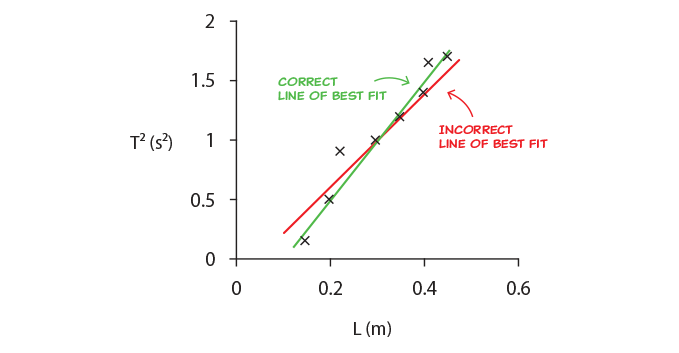 If we then use the gradient of the line of best fit we look at differences in values rather than absolute values, which reduces or eliminates the effect of systematic errors. The gradient represents the result of the experiment and should have a value of 1, so the equation of the line is \(y=x\). How does using a line of best fit reduce experimental errors? Using a graph gives better results than calculating from the data points directly and then averaging, as shown in the table below. The perfect data has a gradient of 1. The random error gives a gradient is 1.04, still very close to the correct value of 1. 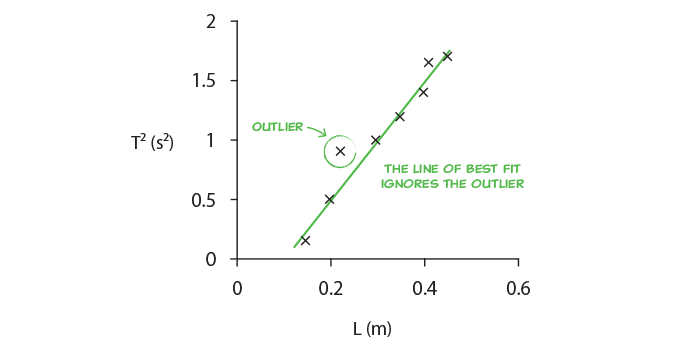 The outlier is ignored by the line of best fit, so the gradient is still 1.04, close to the correct value. Averaging over the data points would not ignore the outlier and would give a worse result of 1.07. 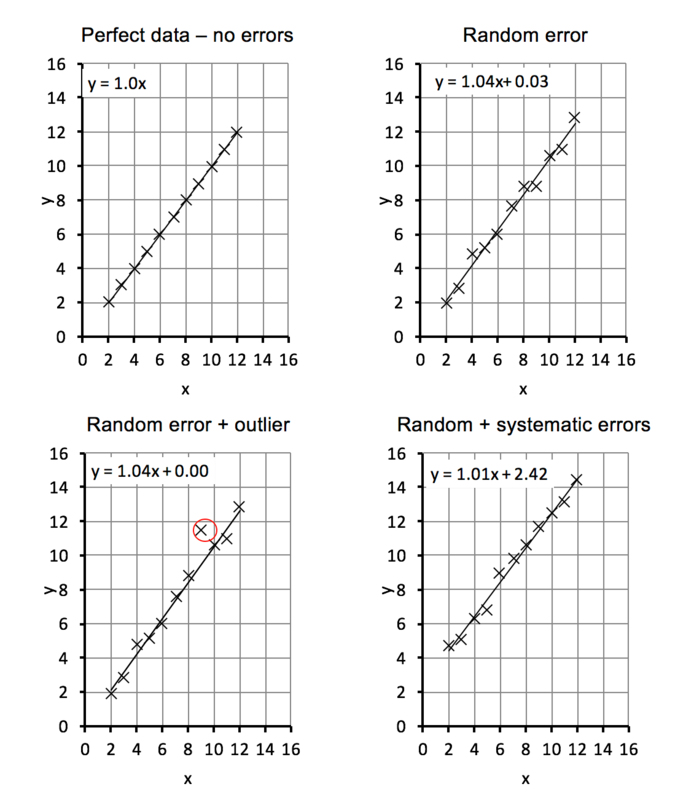 The systematic error shifts up the data by the same amount but does not change the gradient, which is still 1.01. This is still very close to the correct value of 1. However, averaging over the points, in this case, gives an incorrect answer of 1.47. 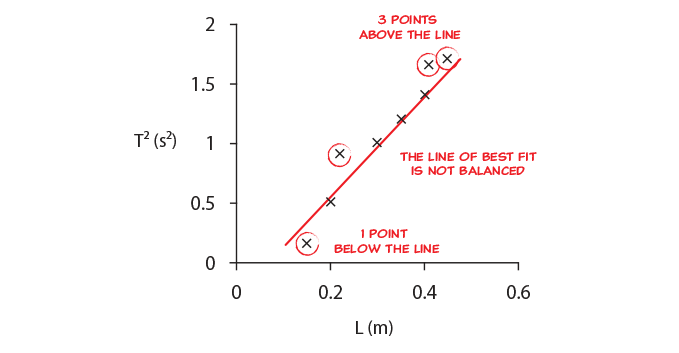 The example below shows common mistakes by students when drawing lines of best fit. The exact mistakes the students have made are listed below. Incorrect scale in x and y-axes. Each box should represent the same value across each axes. For example, if each box is set a value of 0.05 at the beginning of the graph, then one box should always represent 0.05 throughout the axes. 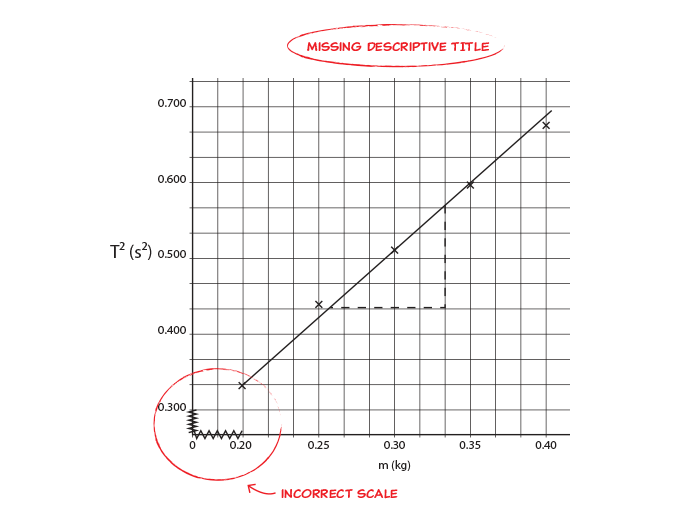 The student should either start the scale at 0 or at 0.20 on the x-axis.